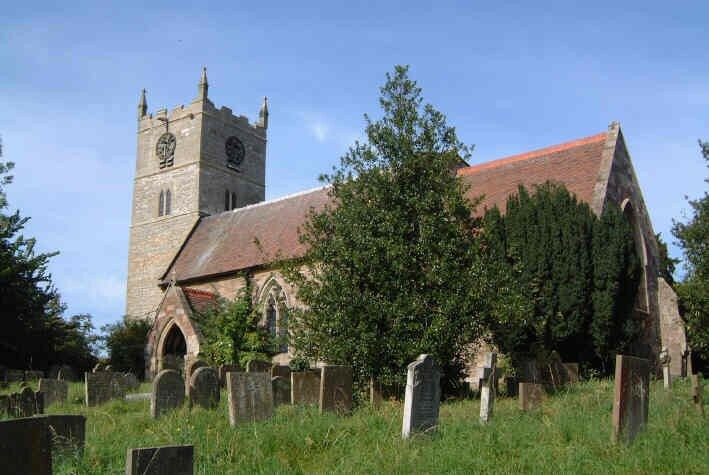 The Domesday Survey mentions a church in Eakring and the first named priest appears in the middle of the 12th Century. Of a simple design, the building has a three-stage tower (Early English with Perpendicular top) with a chancel and unaisled nave. The latter, main body of the church was rebuilt in the days of the first Elizabeth. On a wall of the north porch are affixed two carved stone coats-of-arms of Elizabeth I, recovered from a house in the village in the late 19th Century and, presumably, originally installed in the church to mark the Tudor restoration. Their removal and salvage by a villager would then have occurred in the early 1670s when a new rector, William Mompesson, found a dangerously dilapidated building that he in turn massively restored. The porches date from this time, as did a now-vanished plaque of Charles II’s coat-of-arms, which would have replaced the Elizabethan carvings. A third major restoration by J P St Aubyn, accompanied by the erection of a vestry, took place in 1881 and many of the contents of the church, including the glazing, date only from or just after this period.